There is more than one United States in the Western Hemisphere. Can you name all three? The 14th Trans-Pacific Partnership has taken place in Leesburg, Virginia, on September 6th – 15th. Leaders of Australia, Brunei Darussalam, Chile, Malaysia, New Zealand, Peru, Singapore, the United States, and Vietnam have gathered there to deepen comprehensive market access, regional agreement, cross-cutting trade issues, and new trade issues. Trans-Pacific Partnership (TTP) has been engaged in high-standard economic integration process with comprehensive duty-free access to members’ markets and new trade and investment rules. Currently with nine team members, the Partnership has drawn strong attention and interests from other countries in Asia and Pacific region, in particular, Mexico and Canada. The Partnership Negotiation has also actively attempted to address new issues in the trade arena, such as information technology, green growth and new technologies. 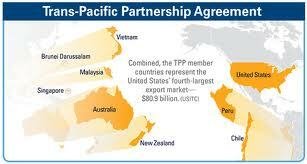 TTP derived from Trans-Pacific Strategic Economic Partnership Agreement in 2007 with four members originally. Two Major Honors for Professor Czinkota! It is a great pleasure to announce Prof. Michael Czinkota has received two significant honors in Peru. First off, he has received a Doctor Honoris Causa degree (his third) for his work in international business and marketing. Second, it was announced by the Universidad Ricardo Palma, that in light of his globally leading work in International Marketing and Business, its new School of Global Marketing and Business is being named after Dr. Czinkota. These honors , of course, reflect the many leading edge research activities carried out at the McDonough School of Business. An article covering the events in Lima can be found by clicking below.